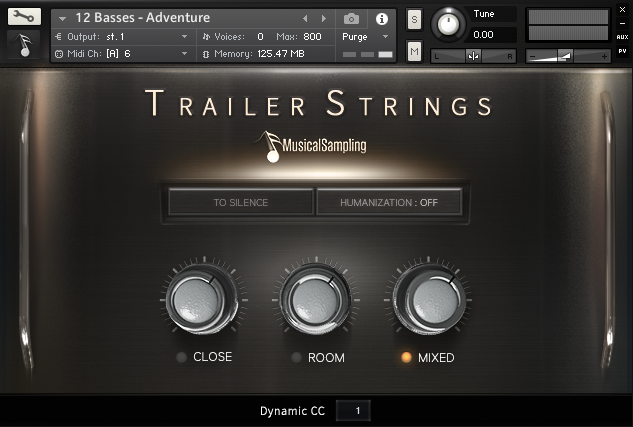 Trailer Strings is the fifth library of Musical Sampling and is so one of the three string libraries in their collection. Soaring strings was the first, which aimed at lush melodic string lines, next came the very playable Adventure strings which compliments their Adventure Brass sample library and now Trailer strings which is the sister of the sample library Trailer Brass. With so many string libraries on the market already, is there room for one more? Let’s find out! For Trailer Strings Musical Sampling recorded four different sections (18 Violins, 16 Violas, 14 Cellos, 12 Basses) in a large concert in 48khz / 24bit and in two mic positions (close and room) and will take aprox. 5.3GB of disk space. 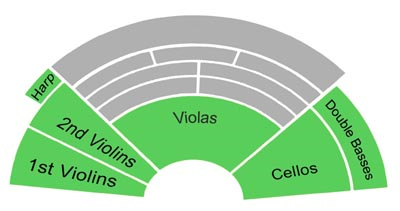 They recorded the strings in a centred wide seating arrangement across the stage, which results in an unorthodox stereo image of the strings. Since I am very used to the ordinary string positioning, I had to really get used to the stereo image of Trailer Strings. It is hard to say if this is a pro or con of the library, but it is definitely different. Trailer Strings works in Konakt 5.5.1 or higher. The overall sound of the library is quite dry and tight on the high and low end of the frequency spectrum. The dynamics go from a very soft ppp to a thunderous fff. Each section has been recorded seperately and they all come with two patches; The Adventure and Breakout patch. There are also two ensemble patches (adventure and breakout). The Adventure patch is a trademark patch/articulation from Musical Sampling which they unveiled with their Adventure Brass library. The adventure patches are scripted in a way, that makes »action/adventure« type lines playing very intuitive. Think of it as a smart patch, that shifts between sustains and staccatos and takes into account your note lengthes and velocities. For some melodic lines, this is a great feature, but for usual melodic string playing, this patch will not do the finest job. If you want beautiful and lush melodic lines rather go for Musical Sampling’s Soaring Strings. I must also point out, that lines, which use staccatos, marcatos and sustains are much more common in the brass then in the strings. The adventure patches are a nice idea and I was really impressed with them in Adventure Brass and Trailer Brass, but in the strings, I had a hard time making them sound how I wanted them with the adventure patch. I usually got a robotic and synthetic sound out of them. As I said, the adventure patch is a very good idea, that I think many developers will adopt, but I think it does need a bit more work from the development side to really make it work as intended in the strings. Luckily the Breakout patches carry a lot more articulations you can choose from. The Breakout patches include spiccato, staccato, marcato, sustains soft and a sustains full articulation. The cellos and doublebasses have three additional FX articulations (behind the bridge, the brooding and »snap & grunt«), which are a great addition to the library. All the articulations can be triggered via key switches. By far my favourite articulation is the soft sustains one, which goes from ppp to about a mezzo piano. It sounds soft yet rich and warm. Creating chordal background with the ensemble patch with the soft sustains articulation is just dreamy. The full sustains are also nice and the fortississimo dynamic level is tremendous. A honorable mention must also go out to the spiccatos and are just meant to go into a high tempo trailer music track. They are very bright with a nice attack, but they do have a bit of delay, so be sure to set your midi track to -20ms. All in all, I do like the unique sound and approach Musical Sampling made for Trailer Strings. Users of other Musical Sampling’s libraries will already be familiar with the GUI and will be able to dive straight into it. The GUI is as straightforward as it can get. You can easily see which patch you have selected and which key switch triggers which patch. You can also dial in your desired microphone settings. The “Humanization” feature is a really cool addition that will randomly adjust the attack and release of the samples which help with the realistic playability of the library. Humanization can be set to tight, normal or loose or off. The “To Silence” feature makes the samples fade out to silence when CC1 is set to 0. This feature is great if you do not like using CC11 for fading out your instruments. With the breakout patches the GUI is a bit different, since you can also select the different type of articulations. I like the slick and not overly cluttered setup Musical Sampling have going in their GUIs. Trailer Strings are priced at 299$. Owners for Trailer Brass can buy them for a discounted price of 249$. I think the price for the library is fair, since you do get a lot of well-produced content for the price. I would recommend Trailer Strings to anyone, that is seeking a fresh and unique new string library. But even the name of the product suggests, that this library is not meant to be your “all in one” strings library. It is designed for a very specific use in mind and I like that. I also think, that if you are an epic or trailer music composer, this library should be in your arsenal since it is designed for this type of music and can produce well sounding results quickly. To conclude, I think Musical Sampling have made a well-rounded product with some great features.